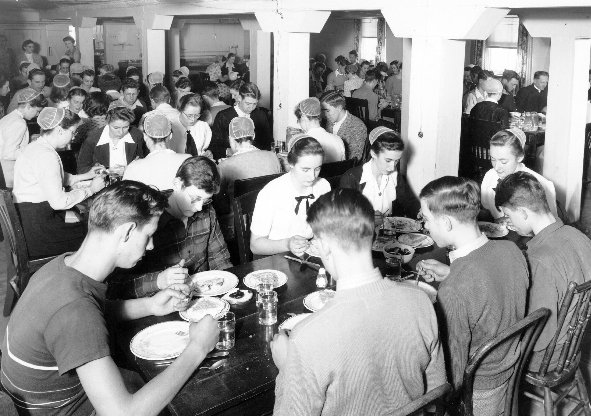 Today’s Photo Friday installment highlights a slice-of-life shot from Messiah College in the early 1950s: students and faculty gathering for a meal in the basement of Old Main, the site of the college’s dining hall until 1956. In that year, the hall was moved to the basement of the Alumni Auditorium. A 2005 article in the Brethren in Christ Historical Society Newsletter highlighted this photo, with a note to readers: “Can you identify any of the students or faculty?” Perhaps placing it on the blog will result in more identifications. Readers: Can you identify any of the students or faculty in this photo? The second table–along the side facing the camera: the woman in the middle is Leoda Climenhaga, my aunt. Karen–and anyone else: open the photo and then zoom. The resolution is good enough to see faces more clearly.